One wall, or "front," of the fort after stabilization. The iron shutters are gone and the bricks have been replaced and remortared. The stabilization work on Fort Jefferson has taken about 30 years - as long as it took to build the fort. Kelly Clark, the cultural resources specialist at Dry Tortugas National Park, points out details of the restoration work. Fort Jefferson in 1898. The fort was never finished — but the structure was also not altered, unlike most of the coastal fortifications from the same era. Corrosion from iron shutters led to the failure of the fort's bricks, leaving its interior coral concrete exposed. The original iron shutters in the fort wall, pushing out the masonry. A replicated shutter assembly in a restored wall. The new shutters are made out of non-corrosive material. The last section of the fort walls awaiting stabilization next year. That will mark the finish of the 30-year project. Fort Jefferson was part of a system of coastal fortifications built in the 19th century — and after 30 years of work, it was never finished. The fort had more than 400 guns and a standing garrison of soldiers. But it never engaged in battle. "It's funny, people are always like, 'But it never fired a shot. What a waste,'" said Kelly Clark, the cultural resources specialist at Dry Tortugas National Park. She sees it differently. "I'm going, no way! It was totally successful. It did exactly what it was meant to do," Clark said. 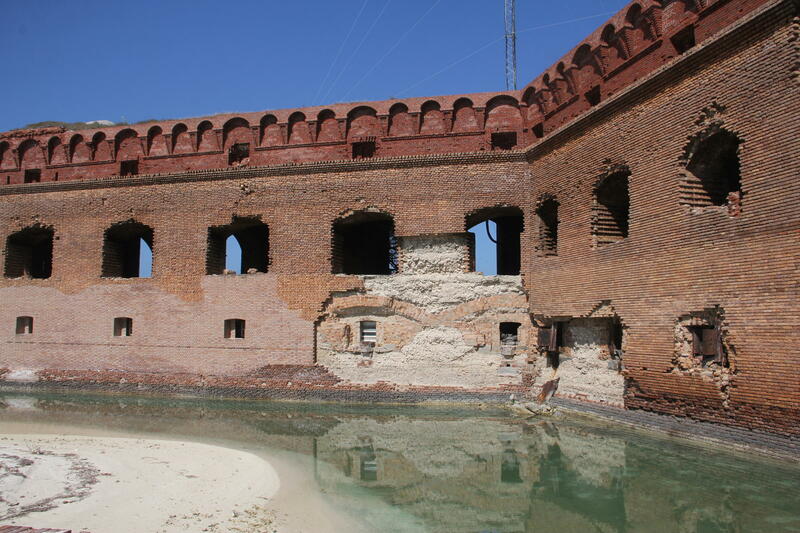 Fort Jefferson's job was to guard the Gulf of Mexico, and access to the all-important Florida Straits. The fort was a deterrent to any other power trying to get at the fledgling United States and its newly expanded coastline. Clark is so into her job, which includes working on the 30-year project to stabilize the fort, that her friends in Key West give her a hard time about it. "When I get talking on this stuff, instead of motormouth, they call me mortarmouth," Clark said. There's a lot of mortar to talk about. And a lot of it has needed replacing — especially around the openings in the fort walls, where cannons once pointed at the Gulf. Those guns were protected by iron shutters, which didn't do so well in the saltwater environment. "The iron shutters started corroding basically the day after they were put in place, in 1858," Clark said. That corrosion pushed out the masonry walls around the shutters. So starting in the late 1980s, the Park Service started pulling out the iron and rebuilding the brick walls. "The early days of this work was heavy on trial and error," Clark said. Along the way, the Park Service and the masons working on the fort have learned how to better match materials and so the repaired sections blend with the old, and hold up. But even now, with experienced masonry crews returning year after year, they have to cope with what they call "the fort effect." "You can try your hardest to think of everything. And get everything. And have a plan," said Jared Fortin, the masonry superintendent for Stone and Lime Imports, from Brookfield, Mass. He's on his fifth year working on the fort. Jacob Smith, left, and Kim Byrd, right, lay bricks to stabilize the walls of Fort Jefferson. "It just seems that always something will break that you didn't think of or some part that almost never breaks, but it breaks out here - because it's out here," Fortin said. And when that happens, "Nobody's running out to Home Depot," said Clark. "It's literally a one to two-day process to get something out here." That's because the only way to reach Fort Jefferson is by boat or seaplane. The restoration uses many of the same materials as the original building. 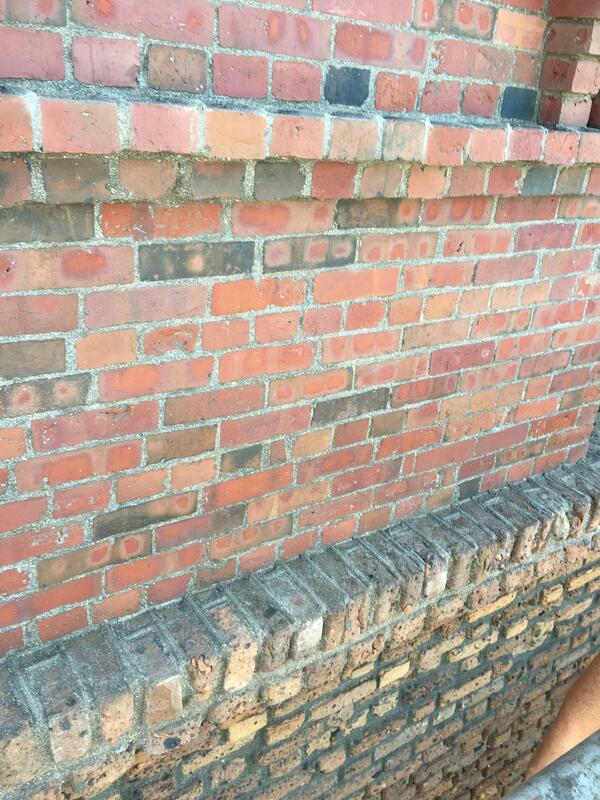 The bricks from the lower levels, referred to as Pensacola brick, are made from Escambia clay, common throughout the Southeast. They come from a factory near Slidell, Louisiana. The natural cement for the mortar came from mines near Rosendale, New York. "We're procuring natural cement from the same exact mines that they were using in the 1840s, '50s and '60s," Clark said. And on the fort's upper level, or parapet, the bricks originally came from a company in Boston called Stiles and Hart. That part was built after the start of the Civil War and they couldn't get the Pensacola bricks any more. Fort Jefferson, like Key West, was occupied by the U.S. Army and stayed in Union hands throughout the war. And like the fort, Stiles and Hart is still around. 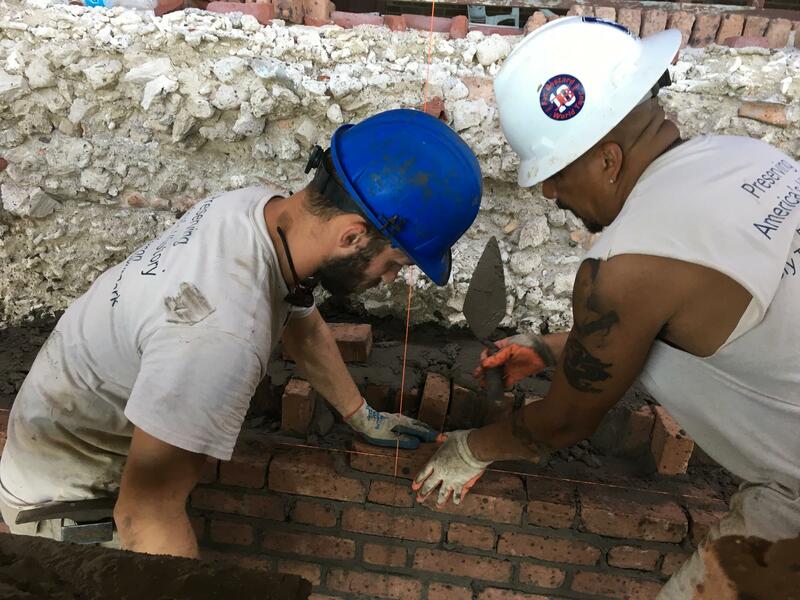 The bricks on the upper part of the fort came from Massachusetts — and the replacements are coming from the same company, which is still in business. "The original bricks up there, they still have the S and H stamp on them and we're getting them from S and H now," Clark said. The Park Service has spent about $25 million stabilizing the fort during the 30-year project. That may seem like a lot for a park that's so remote that it's hard to visit. Last year, fewer than 75,000 people got there. But the outer brick walls were literally starting to collapse into the moat around the fort, leaving the coral concrete that makes up most of the fort's walls exposed. If that had not been stabilized, "you would have had huge sections that would have fallen down," said Fortin. And the intact Civil War-era fort that people marvel over today would have been lost. "You might be able to see it in a picture book or something. But it would have been a big pile of bricks," he said. Most of the series of coastal forts built in the 1800s were adapted to serve new defense technologies, right up to World War II. So they don't look the same. But that isn't the case in Fort Jefferson. "Fort Jefferson is virtually unaltered from its 19th century state," Clark said. "So we are one of the most important records of that point in time. And I think that's worth preserving." Masonry crews work on the fort in the winter and spring, and not during hurricane season. Clark said the work is expected to finish up next year. You shouldn’t name a crocodile or ascribe it human emotions. It’s not a pet. It’s a wild and primitive creature with a lot of very sharp teeth and a crazy powerful jaw. But that didn’t stop anyone from naming the sole crocodile living at Dry Tortugas National Park. Cletus. That's what most people on the park staff call the croc. A few call him Carlos. No one remembers why.